PES Group in the CoR: the Youth Guaranteee is a ‘solution that works’ - Your future is my future - a European Youth Guarantee now! Within the framework of the Open Days of the Committee of the Regions (CoR), the PES Group organized on the 10th of October a workshop in Brussels focused on youth unemployment. Titled “Youth (un)employment: Exploring solutions that work”, the workshop presented successful experiences at regional and local level in bringing young people into work. 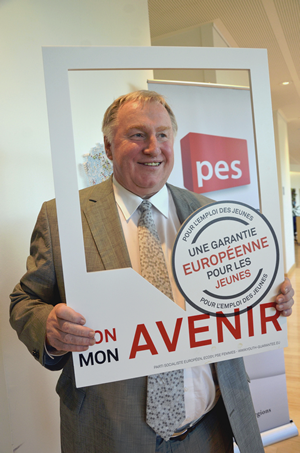 The President of the PES Group in the Committee of the Regions and Minister-President of the German-speaking community of Belgium, Karl-Heinz Lambertz, opened the workshop fully subscribing to the PES “Your future is my future” campaign. The event encouraged participants to share and discuss several experiences and ideas to tackle youth unemployment. The attendants stressed the importance of immediate action in order to avert a social catastrophe, calling for a Europe-wide youth guarantee and a more active role of the regional and local authorities. This sign of commitment made the Youth Guarantee scheme the main highlight of the ‘best practices’ panel. Kaisa Penny, President of Young European Socialists – ECOSY and one of the initiators of the “European Youth Guarantee” campaign, was the moderator of the debate and made closing remarks at the end of the three-hour workshop. The list of documents discussed during the event can be found here.